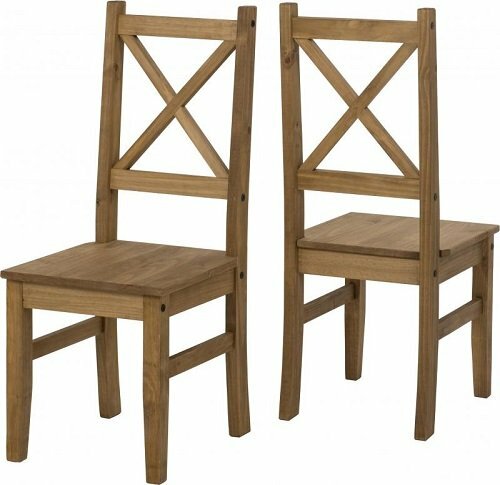 The Salvador pine dining chairs are supplied in pairs, enabling you to buy as many or as little as you need to fit around a new dining table or your existing table. With a chunky design the chairs have great stability. The natural pine has a beautiful wood grain which brings a homely warmth to your space. Touches of metal hardware in a black finish enhance the styling of the chairs, presenting a rustic look which has great versatility, suiting many different décor styles. Constructed from strong, solid pine these chunky, rustic chairs are hardwearing. With a distressed, antique waxed finish the durability of these chairs is enhanced. Complete with metal stud detailing in a rustic black finish. PRICE SHOWN IS PER CHAIR. ONLY AVAILABLE IN BOXES OF TWO.